Over the coming summer months please ensure that you protect yourself from the sun. The incidence of melanoma is increasing and it is essential that patients take care and prevent sunburn. Dr Clayton is a core member of the Salford Royal Skin Cancer MDT. He is experienced in the diagnosis and treatment of skin cancer and received higher specialist training in skin cancer in Leeds and Manchester. Consultant dermatologists are the expcoming erts when it comes to making the diagnosis and arranging the best treatment for skin cancer. If you have a mole or skin lump/bump that is worrying you then it is essential you see an expert. Ask your GP to refer you to a consultant dermatologist. This excellent education video from the Canadian Dermatology Association highlights how to spot skin cancer. Melanoma is still relatively rare, but it is becoming more common. There are 13,000 new cases diagnosed each year in the UK. Melanoma is one of the most common cancers that occurs in people aged 15-34 and is also responsible for most skin cancer deaths. More than 2,000 people die every year in the UK due to melanoma. Early detection offers the best chance of a cure. The most common sign of melanoma is the appearance of a new mole or a change in an existing mole. This can happen anywhere on the body, but most often the back, legs, arms and face are affected. In most cases, melanomas will have an irregular shape and more than one colour. They may also be larger than normal moles and can sometimes be itchy or bleed. An ‘ABCDE checklist’ has been developed for people to tell the difference between a normal mole and a melanoma. 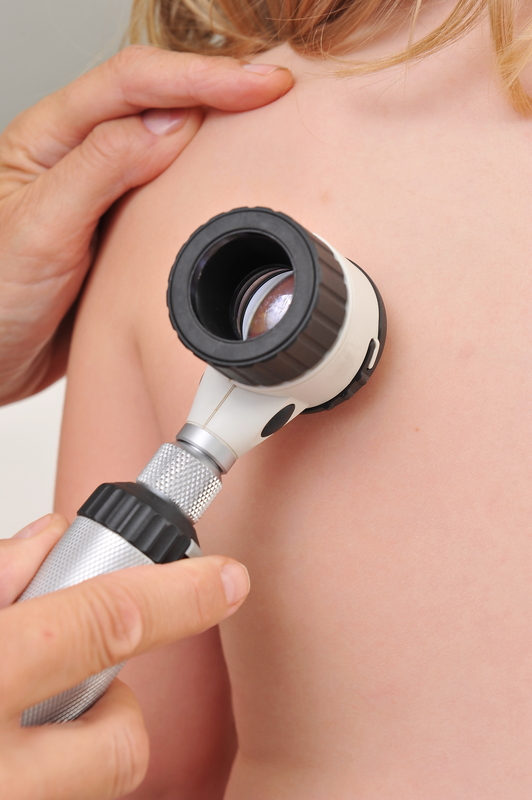 Dr Clayton will perform a full skin cancer check and examine any suspicious looking moles closely using a handheld dermatoscope. Basal cell carcinoma is also known as rodent ulcer and BCC. Basal cell carcinoma is the most common type of cancer in humans and is very common in the UK. Luckily, this form of skin cancer is very rarely a threat to life. BCC typically affects adults of fair complexion who have had a lot of sun exposure, or repeated episodes of sunburn. Although more common in the elderly, sun-worshipers in the UK frequently develop them in their early 40s and sometimes even younger. The tendency to develop BCC may also be inherited. BCC is a particular problem for families with basal cell naevus syndrome (Gorlin syndrome), Bazex-Dupré-Christol syndrome, Rombo syndrome, Oley syndrome and xeroderma pigmentosum. Recent research has detected genetic defects in common BCCs as well as in patients with these syndromes.